Archduchess Auguste of Austria (1875-1964) was born a Princess of Bavaria. She married Archduke Josef August of Austria. 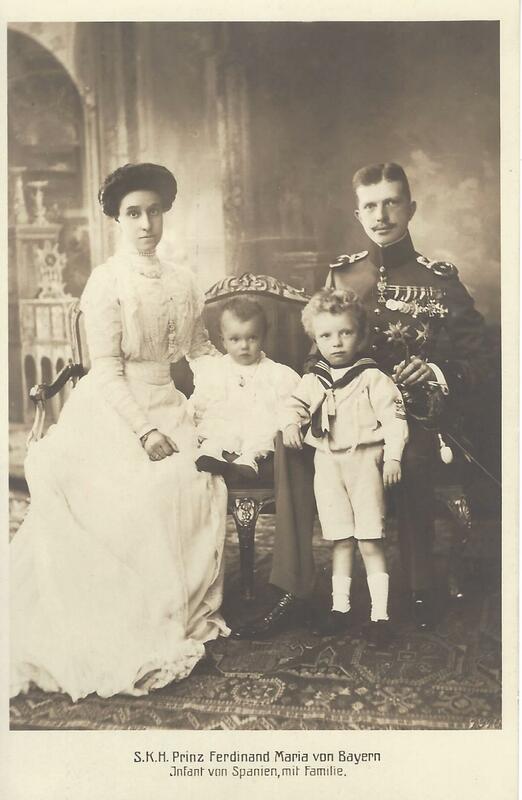 In this 1912 postcard, the Archduchess poses with her eldest child, Archduke Josef Franz (1895-1957), who married Princess Anna of Saxony. Archduke Gottfried (1902-1984) married Princess Dorothea of Bavaria in 1938. Their grandson, Archduke Sigismund (elder son of Archduke Leopold Franz) is de jure Grand Duke of Tuscany. Prince Ferdinand Maria of Bavaria (1884-1958) married Infanta Maria Teresa of Spain (1882-1912), sister of King Alfonso XIII of Spain. 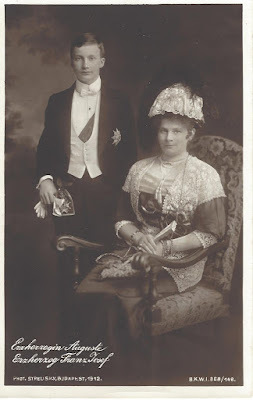 They married in 1906. This postcard shows the couple with their first two children, Infante Luis Alfonso (1906-1983) and Infante José Eugenio (1909-1966). In 1911, Maria Teresa gave birth to a daughter, Mercedes (1911-1953). 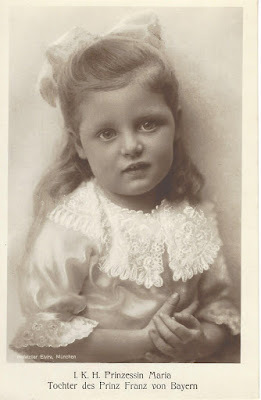 Eleven months later, she gave birth of a second daughter, Pilar, who died in 1918, at the age of 5. 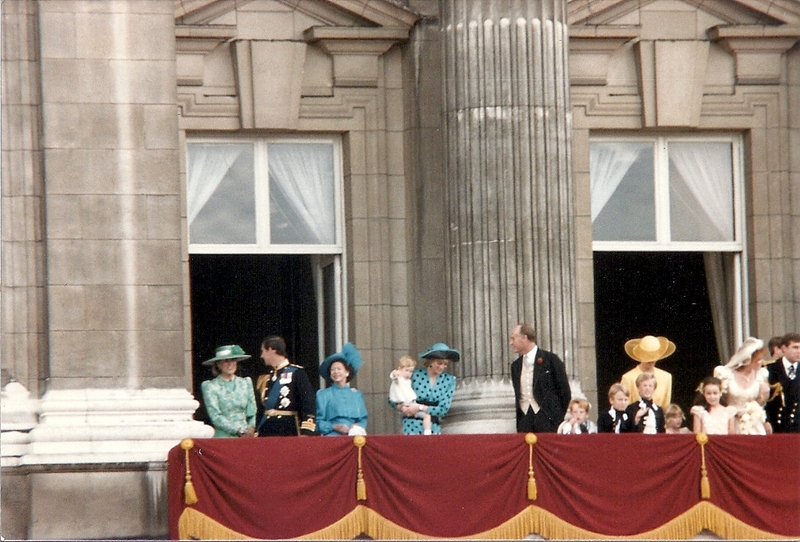 Maria Teresa died less than two weeks after giving birth to Pilar. 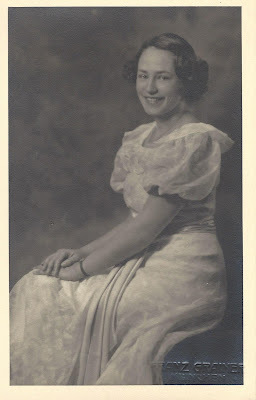 Princess Maria Elisabeth of Bavaria (1914-2011) was the second child of Prince Franz of Bavaria and Princess Isabella of Croy. 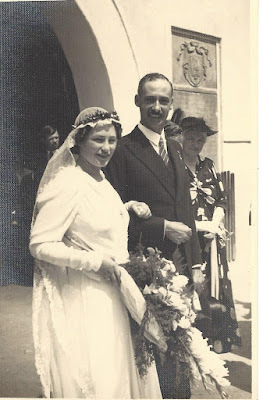 In 1937, she married Prince Pedro Henrique of Orléans-Bragana. The couple had 12 children. 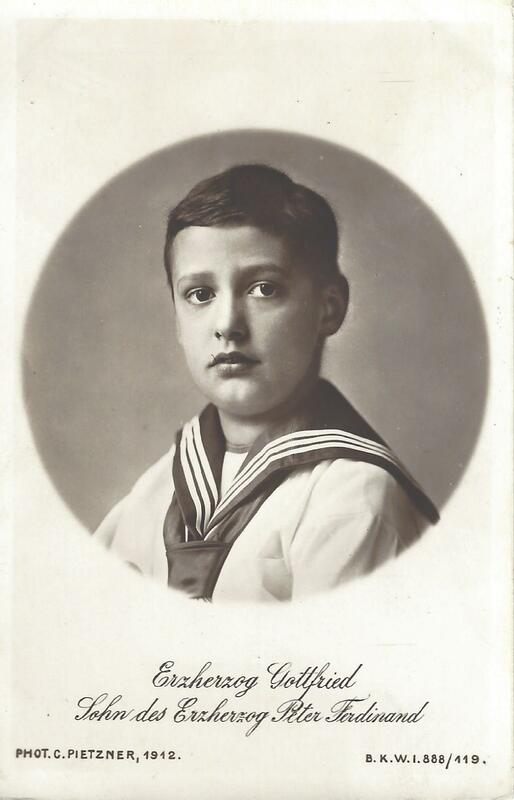 Count Johann Kaspar of Preysing-Lichtenegg-Moos (1919-1940) was the son of Count Johann Georg von Preysing-Lichtenegg-Moos and Gundelinde of Bavaria. Johann Kaspar was the elder of two children. He had a younger sister, Maria Theresia (1922-2003) who was married twice. 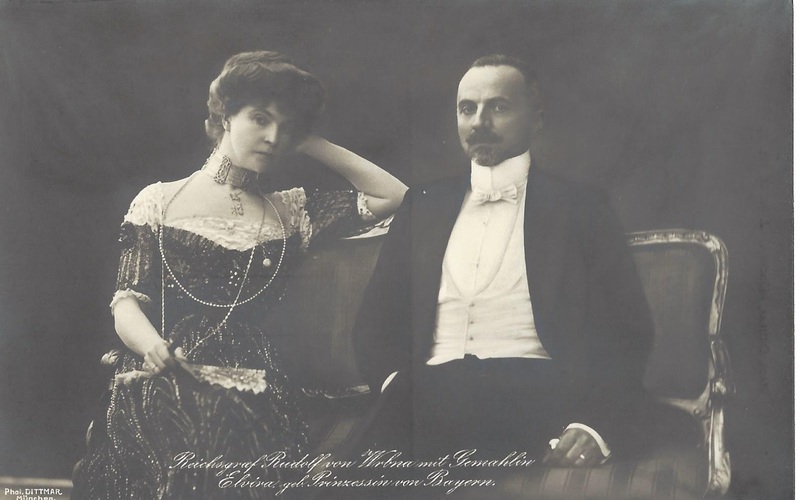 Her first husband, Count Maria Ludwig von und zu Arco-Zinneberg, who was killed in action in 1942, just two years after their wedding. They had one son, Count Rupprecht. A year later, she married his brother, Count Ulrich. 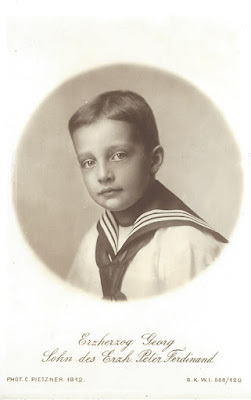 They had two sons, the youngest, Count Riprand, is married to Archduchess Maria Beatrice of Austria. Princess Gundeline's husband, Johann Georg was the son of Count Konrad and his wife, Countess Christiane von Arco-Zinneberg. 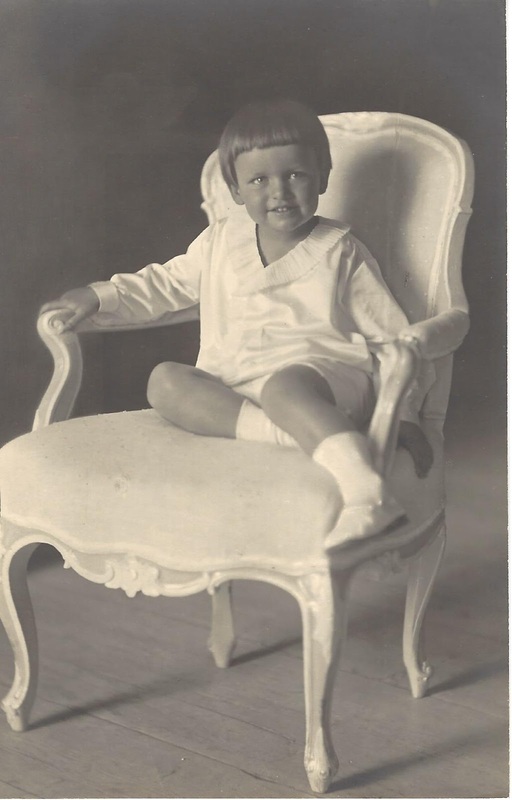 The little boy sitting in the chair died on February 14, 1940 at Zug, Switzerland, at the age of 20.